Seller: FAST shipping from Southern California! Tony Iommi unleashes his fiercest solo outing yet with the aid of legendary vocalist Glenn Hughes (Black Sabbath, Deep Purple). 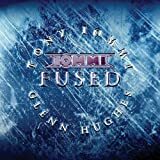 Fused combines classic blues rock vocal styling with the famous metallic crunch of Iommi's signature Gibson SG guitar - the guitar sound that has come to define heavy metal. BMG. 2005.